This past weekend, Honolulu was the host city for the Lions ClubsInternational Annual Convention. 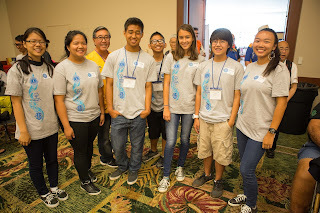 Lions and their student counterparts, the Leos, from around the world came to Hawai’i to take part in this 5 day event. The convention was expected to bring 30,000 Lions and their families to Hawai’i. As part of the host group for the international event, Sacred Hearts Academy Leos were active participants and pivotal in everything from greeting visitors to helping to organize a parade that shut down Kalakaua Ave for almost 6 hours! The Academy's Leos, mentored by Academy teacher Whitney Miyahira and the Kamehameha Lions Club & Foundation, along with visiting Leos, volunteered their time in a bocce tournament in conjunction with Special Olympics HI and a service project at Palama Settlement. Leos kicked off the convention with a lu’au at the Honolulu Zoo where they met Leos from around our nation and the world. 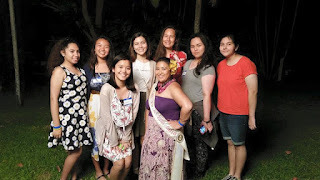 Also assisting at this event were several Academy "Leos-to-Lions", alumnae who served as Leos while in school and have since graduated from Sacred Hearts Academy and now serve their community as full-members of the Kamehameha Lions Club.